Bell’s Palsy, an irritation to the seventh cranial nerve, affects thirty to forty thousand Americans each year. 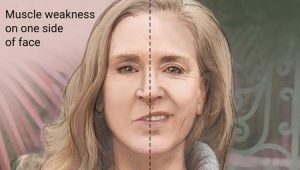 Unilateral weakness or paralysis of the facial muscles is not completely understood, but thought to be due to reactivation of HSV herpes virus. Symptoms, which usually manifest and peak within two to three da ys, may include difficulty blinking, speaking, eating and drinking as well as sensitivity to sound, diminished taste, pain behind ear, and problems with salivation. While medications are usually introduced to manage the inflammation and inhibit the effects of the virus, therapy is typically requested given the possibility that facial exercise reduces recovery time. The thought is that release of the tissue along the nerve pathways next to the middle ear and mastoid can help to recreate the brain-to-nerve-to muscle routine. As each patient is unique and has a different functional profile, at Southwest Rehabilitation, we tailor our program to fit each patient. Typically, we focus on education so that each patient understands how the facial muscles work, the innervation pattern, and the effects of inflammation on the nerve as it passes through the boney structures. We address the patient’s symptoms, such as drooling and hope to ease much of the anxiety by reducing stress associated with “not knowing.” Using a combination of exercises, myofascial release and stimulation, patients often learn to use compensatory strategies coupled with improvements in muscle function to aid in the recovery process. In approximately 70% of patients with Bell’s palsy, completely recovery occurs within 6 months without treatment, according to Peitersen’s article in Acta Otolaryngol, 2002. Our hope with speech therapy is to improve each patient’s odds of a full recovery!